Look, it's a UFO! An Unidentifiable Furry Organism. Bigfoot: Endangered Mystery! In the dense forests of the Pacific Northwest dwells the strange and beautiful creature known as "Bigfoot" perhaps. Sadly, logging and human settlement today threaten what might possibly be his habitat. Although if it's not, they don't. Bigfoot populations require vast amounts of land to remain elusive in. They typically dwell just behind rocks but are also sometimes playful, bounding into thick fogs and out-of-focus areas. Remember, it's up to us: Bigfoot is a crucial part of the ecosystem, if he exists. So let's all help keep Bigfoot possibly alive for future generations to enjoy unless he doesn't exist. The end. The gentle sasquatch, or "wood ape," is North America's incarnation of a story that exists in every culture - that of the wild or hairy giant who lives just outside of society. Even in the Pacific Northwest, various legends existed among the native tribes before there was a single name to connect them. This one has a very soft, non-threatening face, and though the proportions are slightly inhuman - the eyes are more than halfway down the head - it still looks like something that would shy away from human contact, rather than trying to attack. The body looks nearly human, as well. 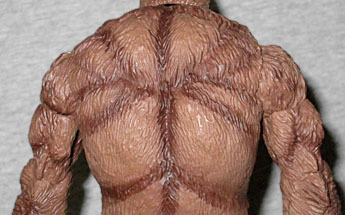 It's wider than usual, and has a stooped posture, but even through the fur you can make out familiar muscles. Would you expect any less from Jean St.Jean? The hair only thins out at all when you get to the hands and feet - even real apes aren't head-to-toe furry, so saquatches must get really dang hot and uncomfortable in the summer. Of course, they also have to survive through some cold and dreary winters, so maybe their pelts come and go based on the seasons. It's a lovely sculpt, regardless. Even the soles of his (not at all oversized) feet are fully detailed! This innocent giganto has no accessories, because Bigfeets aren't the tool-using type... or at least, that's what they want you to believe, so you'll let your guard down. Sometimes you'll see them in your garage, using the belt-sander. Anyway, the toy does have decent articulation, because St.Jean Studios knows the score. The ankles are large balljoints with studs all over the ball for a tighter grip. The hinged knees aren't ratcheted, but they do have a raised lip that fits into grooves inside, again providing extra stability. There are also H-hips, a swivel waist, swivel wrists, hinged elbows, swivel biceps, swivel/hinge shoulders, and a balljointed head. It's a decent amount, but you can't quite get him in a "Frame 352" pose, and he always seems to be looking down. 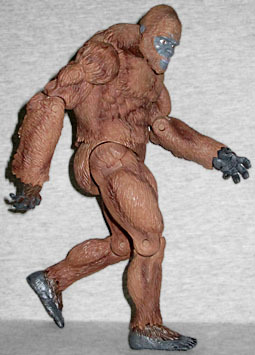 The Sasquatch is a ruddy brown with dark grey skin and black nails. There are darker shadows painted on, though they're of inconsistent quality: on the front, they actually blend like shadows, but on the back they just look like stripes of paint. We've certainly seen worse on mass market toys (remember this Hulk? ), but the airbrushing should ideally fade a little more. To fill out space in the giant blister and help offset the (admittedly high) cost of the figure, he comes with a small display base. 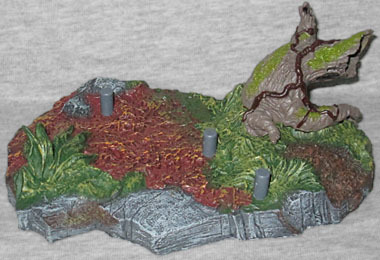 This one is just a 5¼" x 3½" chunk of the rainy pine forsets of Sasquatchtopia - stone, dirt, leaves, a broken tree stump, etc. There are three huge footpegs, giving you options in where you place him. But this is a sasquatch - would he really walk where you expect him to? If you do ever see a Sasquatch, don't shoot it: it's a protected species in both Washington and Oregon. 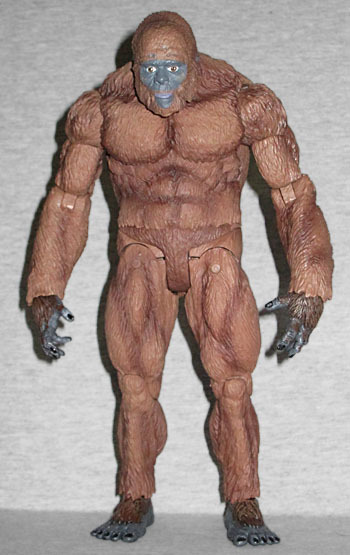 There have been Bigfoot figures before, but the only one that even comes close to this level is the Marvel Legend. 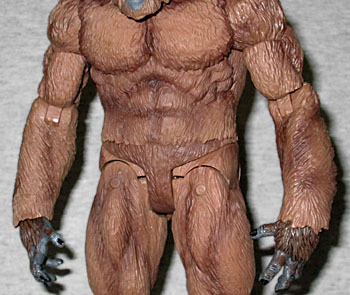 The Creatureplica North American Sasquatch is an expensive toy, but it's made with passion. Passion and quality. There are plans for potential variants and exclusives, including head sculpts representing different regional and tribal descriptions (such as a Skookum or an Elder sasquatch), but those are just maybes and this is a physical reality. Get yourself a mighty stink-ape!